“Just the thoughts of a fifteen year old boy waking up on an African ship with no idea how he got there give me chills, but that is what happens to Jack Sligo in this story. And it is what happened to David Paul Collins in real life. Spellbound by his Irish grandfather’s tales of adventure, Jack Sligo had dreams of traveling around the world as part of the crew on a cruise ship. But did he dream of starting out this way? “Shanghaied” is a novel based on the author’s own true story as a merchant seaman, making this not just a fictional story, but a story told with realistic accounts of what actually happens in the life of a merchant seaman. 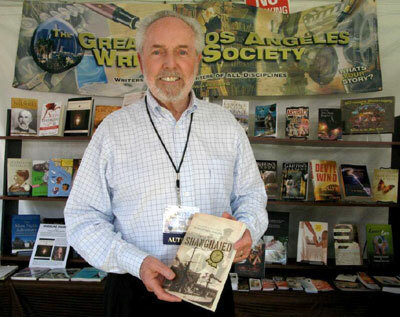 David Collins in Greater Los Angeles Writers Society (GLAWS) booth at the recent annual Los Angeles Book Festival. Keep up to date with Jack Sligo and David Paul Collins. “Follow” us on Twitter. Shanghaied is now on Twitter! Follow the book Shanghaied and other interesting information from author David Paul Collins.